Ok so what you do is go to your profile and then go to costomize profile its in a box under your name but to use a picture for a background you have to save it to an album on your profile first. 1.Go to QUICK LINKS (next to LOG OUT) and select Pictures and Albums. 2.You should have a picture or background you like already saved on you computer. 3.Select ADD ALBUM and go ahead and name it and everything. At the bottom select PROFILE so it can be used to edit your profile. 4. Once an album is created, where it used to say ADD ALBUM, it should say UPLOAD PICTURES. 5. 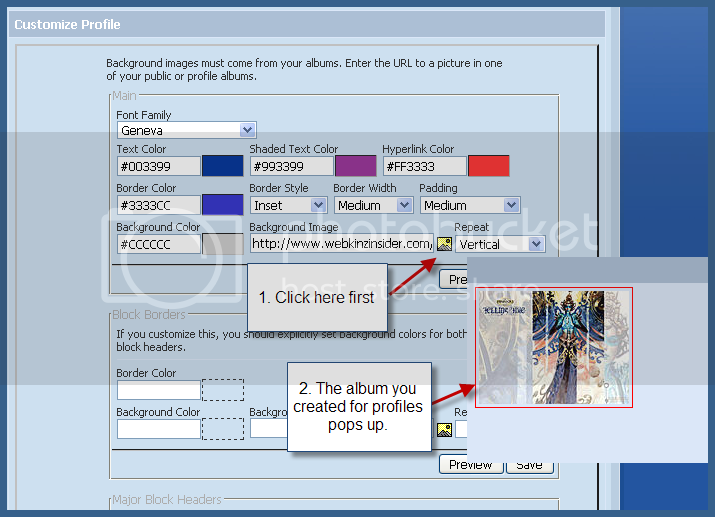 Browse for the picture you want on the computer and upload it. 6. Go to your profile again and in the first blue box (in red) it should say CUSTOMIZE PROFILE. 7. Once you are in customize, you can change the colors of fonts and stuff. There is also a box that says: BACKGROUND IMAGE. There should now be a yellow box of what looks like a mountain. Click on that and it will show all the photos from the album you created. You can put as many pictures in your album so you have a selection to chose from for your background. Finally (I know it's long ), you can edit the background and the individual boxes on your profile. You can play with it. Here's a guide for you...it'll tell you all you need to know! I'm lost after number 5...for 6, do you go to Quick Links and Your Profile? I see nothing in red. I went to my profile. The pic I want is now the Album cover, but should I upload it again to make it be in my album? sorry, i still can't send PM's or post comments on profiles. EDIT: wait, now i can. You can add a photo for every cell block on your profile. I only had one photo to choose from... I really need to do something with my profile to spiff it up. Let me know if that helps at all. Thanks for alerting me... you know, sometimes things are perfectly understandable to me, not realizing Azriel-Speak doesn't make sense to others! Last edited by Azriel; 11-22-2008 at 08:01 PM..